A third of Britons don’t have any money to save, with North East families having cash reserves for just 11 days, warns a Legal & General report. Cutting spending on energy and clothes are the most popular personal "austerity measures" another report adds. The savings of an average Briton would be cover less than two weeks living expenses, according to the “Deadline to Breadline” report from the financial services firm Legal & General. The report says that afterwards they’ll have to turn to the governmental for help or ask friends or family for support. “It serves as a stark reality check to see that most of us are still in a precarious financial situation - the average working-age family is just 11 days away from the breadline,” John Pollock, Legal & General chief executive, said. However, the 11-day period is the minimum that affects some people in the North East of England, in Greater London the figure stands at 79 days. Another market research firm Nielsen found that the rising energy bills are making 60 percent of Britons save on energy, with another 58 percent being forced to cut on clothes spending and 57 percent enjoying fewer takeaway meals. 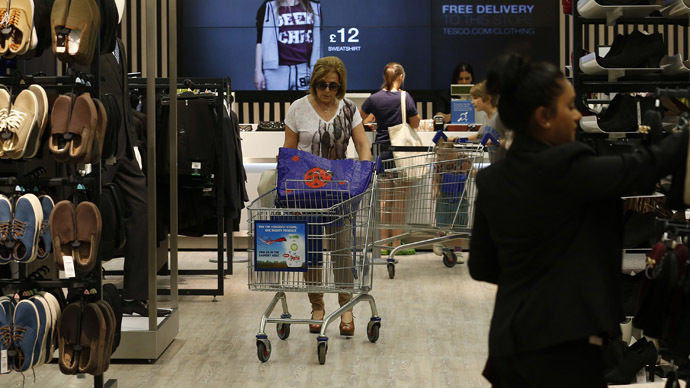 Consumer confidence also dropped, as the corresponding index fell to three points to 84 from its six-year high of 87. This put the country in between the global reading of 94 and the European index of 73. The disheartening view from both financial surveys shows that average working families have yet to feel the benefits of economic recovery. In a consumer confidence index 100 points serve as a baseline, with any readings below and above it reflecting levels of optimism and pessimism.